In the last days of December 2014, the Sunreef Yachts shipyard launched the first unit from the newest line of sailing catamarans- the Sunreef 74. In accordance to the wishes of the Owners she has been named Wildberry. Her main characteristic feature is the elegant and dynamic design, which has been achieved thanks to a sleek superstructure with vertical bows and limited freeboards. The yacht has impressive living space and a fully open 35m2 saloon, which is located on the main deck, and offers spectacular panoramic views. The unit is designed to accommodate up to 6 guests and 2-3 crew members. The yacht can be easily maneuvered by only 2 people. Sunreef 74 Wildberry is a private multihull dedicated to long cruises. On the flybridge there is a large lounge area with a sofa and a table that is adjustable in height, which can be lowered and turned into a couch. 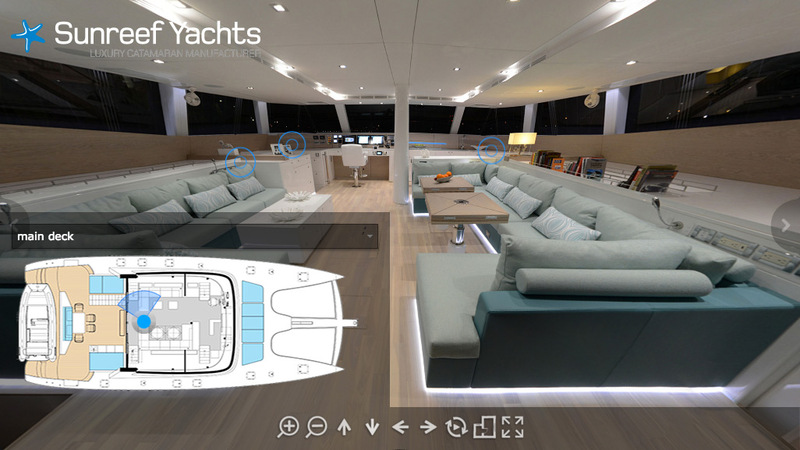 The cockpit, which also provides comfortable dining and relaxing space for guests, can be accessed from the sundeck. The spacious hulls contain a 20m2 master cabin with a king-size bed, a wardrobe and a bathtub, as well as 2 guest cabins (including one VIP), comfortable crew quarters with a double bed and a fully equipped galley. The lower deck includes a laundry room and storage space for water sports equipment. As the Owners are planning a long journey, the catamaran has been intelligently designed and offers plenty of additional storage space for food supplies and water toys. One of the greatest advantages of the new Sunreef 74 line is the short time of manufacturing, which is only seven months. In the near future two more Sunreef 74 units will be launched- 19th Hole and Blue Deer, which are twin catamarans that will be available for charter from the Sunreef fleet. In 2014, Sunreef 74 74 has replaced the Sunreef 70 Sailing line.